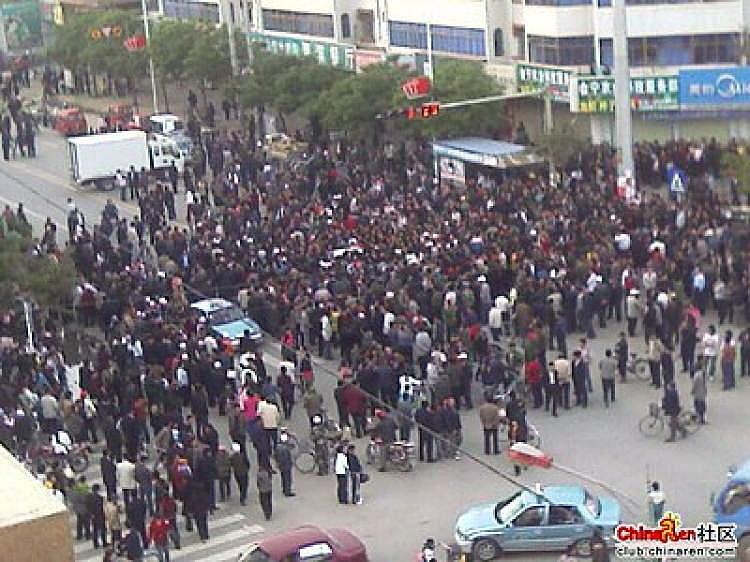 Details have emerged about a large protest that recently occurred in Baiyin City, Gan Su province. The protest was sparked after bystanders witnessed the police beating a university student who had run a red light on his bicycle at noon on May 19. The protest escalated to the point where several thousand people gathered and blocked the road. Eventually, after a failed attempt by a communist party official to calm the protesters—riot police with electric batons stepped in to disperse the crowd. According to witnesses, when the student, named Zhang, tried to run the red light, traffic police grabbed him off his bicycle and proceeded to deliver a round of beatings to him. When the policemen responsible tried to escape, the crowd was further angered. They flipped over the police car and surrounded the policemen. After several hours, an official came and made a speech trying to resolve the confrontation. However, he was unsuccessful and many surrounding residents came to join the protest. Well into the evening, the road was blocked by thousand people. Around 9 p.m., riot police showed up, and using electric batons, scattered the protesters. The police car was towed away. Later, a few hundred people marched on the county level Communist Party and government affairs building and vandalized it by smashing windows and breaking down doors. The sign of the county government was taken down and stomped by the protesters. Another police car at the building was also flipped over.